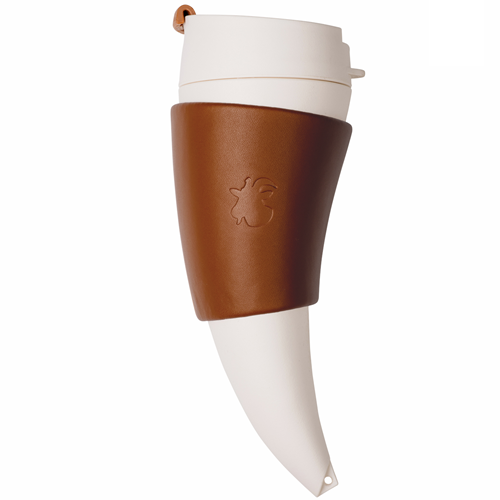 GOAT Mug is a one-of-a-kind coffee mug that was inspired by a legend of goats discovering coffee. First and most obvious is its shape, which resembles the shape of a goat’s horn. The shape itself also makes drinking from the mug easier because of the angle that a curve creates. We designed a special holder which easily transforms into a coffee mug stand. It has a perfect leather touch. The mug is made from a completely healthy material and it is BPA FREE, which means it is totally healthy for you to use it. It holds 473 ml or 16 oz. and it keeps its content warm for up to 2 hours. REAL LEATHER or HEMP textile. As easy as 1-2-3, your GOAT STORY coffee mug will be able to stand on your office desk and it will be at a hand´s reach all the time. Just take the handle off, turn it around, place the mug in it. Voila! The ergonomic shape will help you drink your coffee. Have we mentioned that it won't fall over? If you love coffee as much as we do, you would like to have a sip of it at every step. However, most reusable coffee mugs are pretty unpractical to use. Which is why you will LOVE GOAT STORY coffee mug. It comes with a cross body strap, which lets you carry your business case in one hand while replying e-mails on your phone, in between sips. Also, you can use the shorter strap to attach it to your bag or carry it around your wrist and keep your hands free. * No goats was hurt in the making of this bottle. Super awesome product and I love it! I really like this design and its also very easy to carry n handle.